I discovered this amazing website yesterday, a real treasure trove, full of delights especially so if you have to buy a present for a baby. Bianca and Family also restore furniture. Look at the beautiful school desks that were featured on Apartment Therapy. The magnets above reminded me of a few things which I’ve seen that are as kitsch and I love. I went to Saigon earlier this year and spotted the selection of toys below. Last week I went to see Walking In My Mind and was delighted to look into Yoshitomo Nara‘s student shack and his display of toys and dolls. What I really want to get is these earrings from Les Nereides‘s diffusion line, N2 which are also available as a brooch and cute hair grips. But if wearing kitsch is not for you, there is always decoration. This wallpaper from Nono fits the bill. Or buy this beautiful tree designed by Millicent & Frank. Although I think it’s the little deers that complete the look. Being a young adult and yet nowhere near being settled, I am finding it difficult to escape the many conversations about property, weddings and babies. I am definitely more well-versed in the subjects of music, film and art. It gives me hope that there are products out there for the adult who is not ready to grow up. The adult who has similar sentiments as I do. The makers of this wallpaper know that there are people out there like me. People who have Fun high on their priorities. 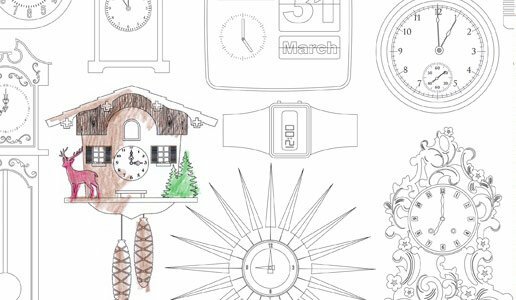 This wallpaper is left uncoloured in so the kid in you can do the colouring in! Interactive walls? Why ever not?